Posted on 2019/04/08 18:46:37 (April 2019). Fifth day of my vinegrowing course. 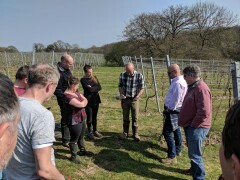 Today's topics for the morning theory session were "vineyard floor management" (a subject which might historically have just been called "weed killing" but nowadays is portrayed in a more positive light) followed by an overview of approaches to sustainable viticulture. As I remember my Mother saying many years ago, there is no scientific definition of what a weed is. It's simply any plant growing somewhere you don't want it to be growing. Opinions on the presence of other plants in the vineyard (apart from the actual vines) seem to have varied historically, and part of the reason the subject now tends to be referred to as the slightly more constructive "vineyard floor management" is the acceptance that there can be advantages to having other species of plant present. There are certainly disadvantages to weeds - chiefly that they compete with the vines for resources, and they make access more difficult. They can also harbour pests, and less intuitively can increase the frost risk. On the positive side though, among other benefits "weeds" can help to prevent soil erosion (recently the subject of a report concerning Prosecco), they encourage biodiversity and the competition for resources with the vines can be a good thing as this can reduce vigour and encourage higher grape yields. The traditional method for controlling weeds is cultivation (i.e. churning the soil up), however this tends to be a lot of work, and only briefly suppresses weed growth. Other approaches include temporary cover crops, mulching, flame weeding and using animals to graze on the weeds (sheep are apparently very common in English vineyards) - but, apparently, none of these are as effective as herbicides. Although we were told viticulture is approaching a challenging juncture in this regard, given that increasingly more and more of these substances are being banned and the industry will need to rely more on the alternatives in the future. This led the way into an overview on sustainable viticulture - organic, biodynamic and other approaches. I hadn't fully realised quite how much snake oil there was in biodynamic viticulture - working to phases of the moon, and odd practices involving burying cows horns all sound a bit pagan to me, and not very scientific. In the afternoon we headed over to the vineyard, and for the first time we actually had pleasant weather! It was very nice to see Rock Lodge and Deer Field in blue sky for a change. Tom started by recapping some of subjects covered during the morning's theory session, and showing us some relevant bits of machinery which can be attached to a tractor for cultivation. We then headed out into the vines to practice attaching a new wire to the trellis, and then dropping the canopy wires down ready for tying up. He also showed us some examples of Pendelbogen training system, then we finished off back at the shed for a demonstration of the grafting machine.